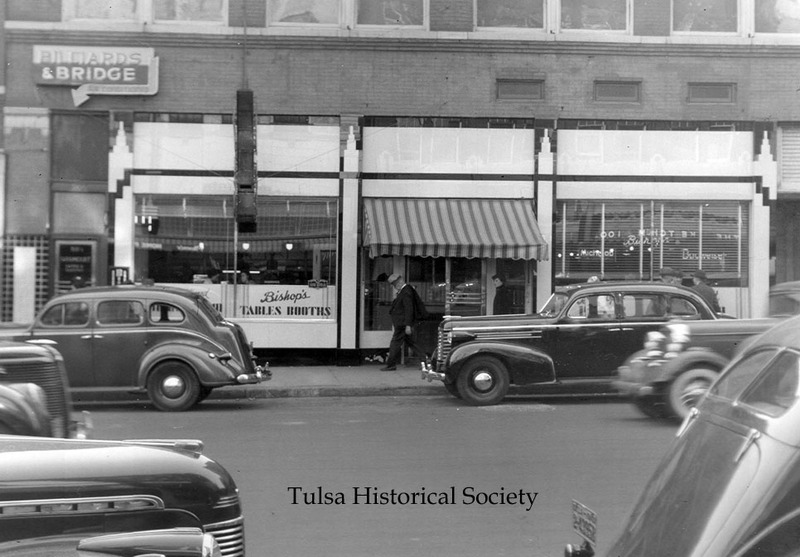 Back in the days when downtown Tulsa was The (only) Place To Be, there were plenty of cafes and diners for lunch and breakfast but not so many restaurants, especially one's that were open 24 hours. And really there was only one place to go, to be seen and to see others. I am talking about Bishop's Restaurant of course. I posted this postcard on the THS Facebook page the other day, which was Bishop's Driv-Inn (not to be confused with the restaurant). 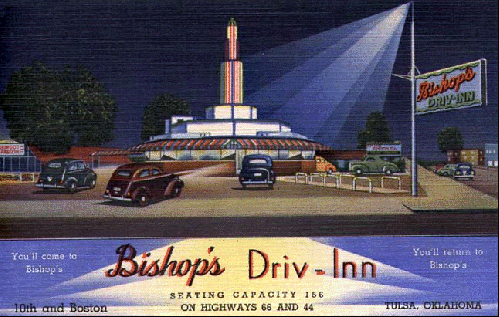 Although many remembered this pretty, neon spot that was located on 10th and Boston, the memories and comments always drift back to the other Bishops. THE Bishops that was located at 510 S. Main, in the hub of the city. I thought I would share some of those memories, along with a little bit of history. 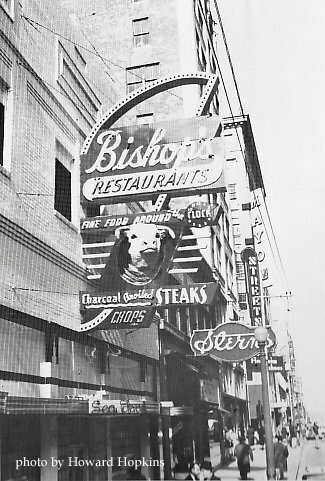 I couldn't find out much information on W.W Bishop other than he opened the first Bishop's in 1913 and it was located at 15 E Third St. It was a counter-only cafe/diner back then. That could very well be him on the far right, but I cannot verify that. Sometime in the early 1920's he upgraded the place and enlarged it. This ad was in a 1927 booklet. This photo, taken around the same time, shows the new signage in front. WW. Bishop became partners with J.H. Powers and together they opened a bigger, better full-scale restaurant in a building on Main Street and 5th. The year was 1930. 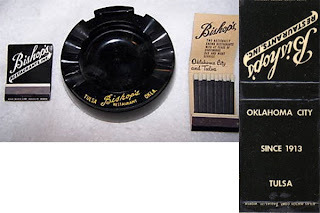 Customers in that era included the likes of William G. Skelly, Josh Cosden, Harry Sinclair and J.Paul Getty. 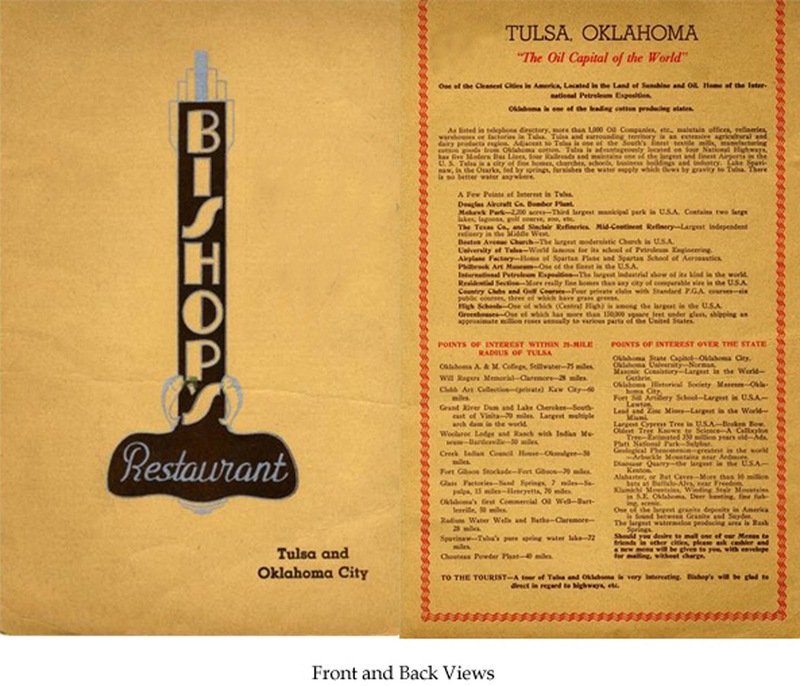 They also opened a Bishop's in Oklahoma City. Moving along into the next decade, social activities swirled around Bishops; first dates, anniversaries, special occasions or lunch -Bishop's catered to them all. Everyone loved the infamous Brown Derby which came with french fries or onion rings, grilled onions and hot rolls so light they floated away- all for .65 cents in 1948. 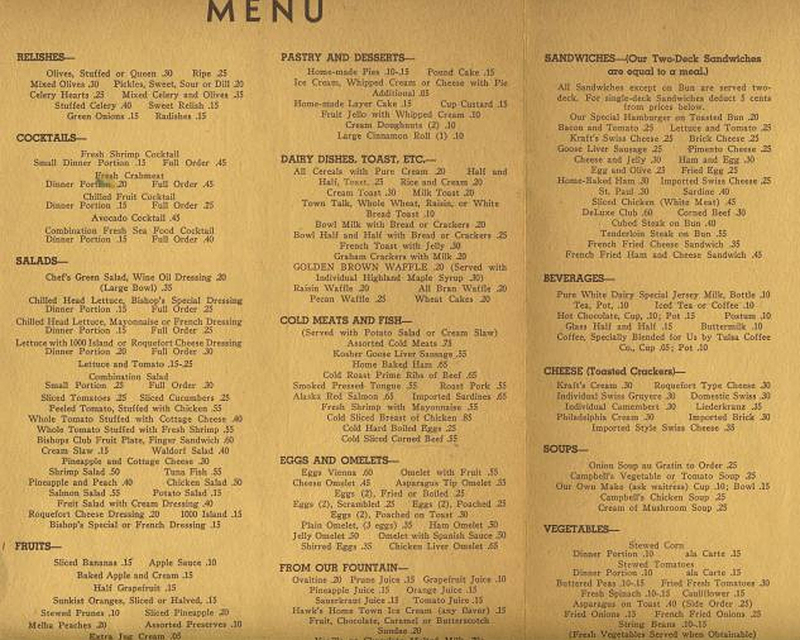 A steak platter for two was featured for $1.85. What better place to go before or after a movie. Counter seating or a booth? The U-shaped counter was huge with red and chrome swivel chairs. The floor was black and white checked. You were always served well by one of the many waitresses employed there. Wearing a starched cotton uniform, a ruffled apron, small cap and a handkerchief in a little breast pocket, they were always neat as a pin, some having been there many years. For three decades there was no place equal to Bishops. 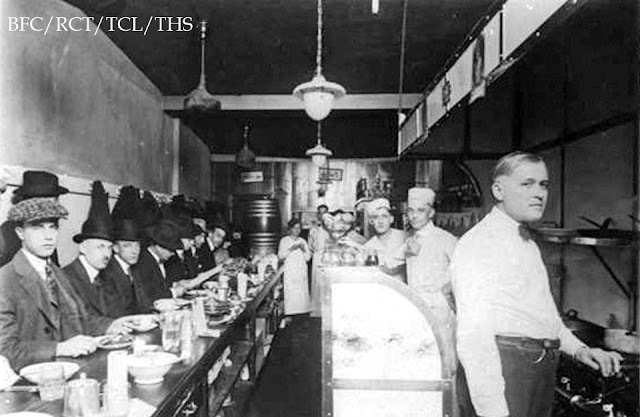 When the restaurant went to 24-hour service, more than 70 waitresses were employed. New signage out front included the famous Hereford cow's head when a remodel was done in the late 1940's. A back room now included a "buffeteria" offering. The upstairs of the building was used as a storage area with cowboy and Indian artifacts. Later it was rented out to a competitor, Mike's Restaurant, which in 1951 was the birth place of the Spotlight Club. Memories shared by Tulsans were mostly about the food- from "best cheeseburgers and fries" to the "best waffles in the world" served on heavy white china that had a green rim on it. The house salad dressing, rum cake and chicken pot pie were other favorites. And hash browns like no other. My neighbor, a Central grad, fondly remembers going there "with the gang" late one night after a school dance. She said they all ended up dancing outside in the street. 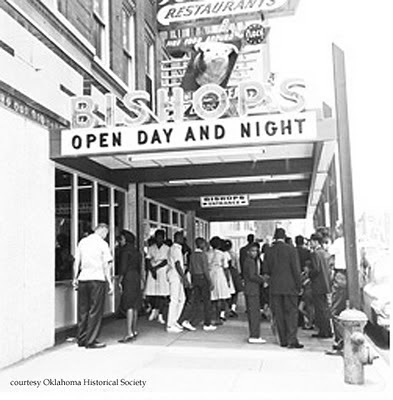 Another memory was of a sign at the front register that read, "We Reserve The Right To Refuse Service To Anyone" which at that time was a reference towards segregation and the unwelcomeness of the black population to eat there. 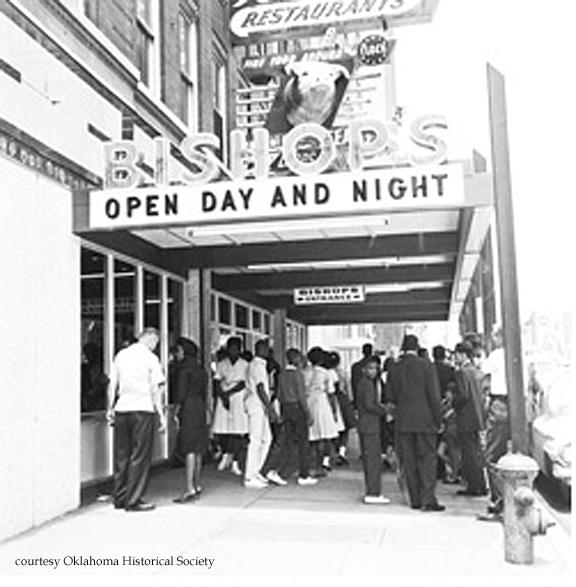 The other Bishop's Restaurant in Oklahoma City was eventually picketed by civil rights activists in 1963 who staged a sit-in. 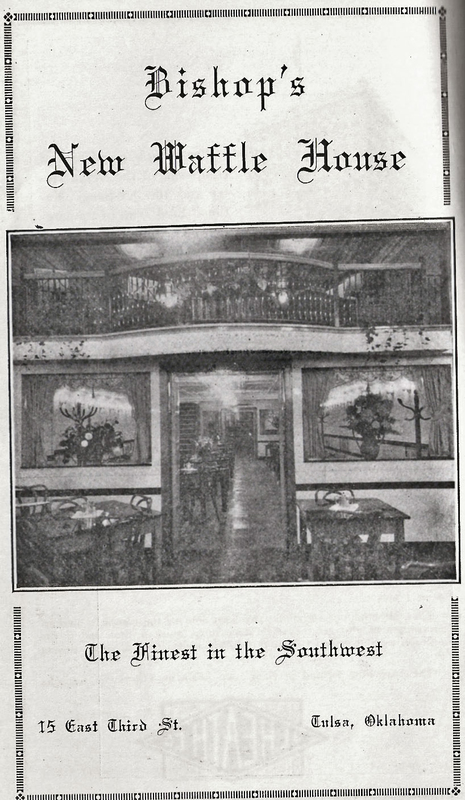 On Saturday, February 19, 1966 Bishop's Restaurant closed it's doors for good. Plans were to tear down the building and put in one of the infamous parking lots. The Saturday morning regulars along with two favorite waitresses drank a champagne toast to the end of a Tulsa institution. Mix ingredients, adding broth last to give mixture the consistency of soupy meatloaf. Using 1 cup of the mixture for each portion, make thick patties and brown them in oil. Set aside. Boil ingredients together for 2 minutes. Drain the meat patties and put in a baking dish. Cover with Sauce Diablo. Bake 30 minutes at 350 degrees; longer if desired. Put honey and salt in electric blender and blend until creamy. Add vinegar and lemon juice. On slow speed add salad oil very slowly. oil and let it stand overnight. over the bottom of the pan. Cream 1 cup of the butter and 2 cups of the white sugar together. Add eggs one at a time mixing well after each one. add alternately with the buttermilk to the egg mixture. Stir in the vanilla and rum. Pour batter into prepared pan. Bake at 350 for 1 hour. While cake is baking, prepare glaze. Melt butter in a saucepan; add water and sugar. Boil for 5 minutes, stirring constantly. Allow to cool and stir in rum. Remove cake from oven, poke holes in it with a fork and pour all of the Rum Butter glaze over cake while still warm. Leave cake in pan for 2 hours before turning over onto serving dish. The medical profession was changing drastically by the late 1950's. The role of Family Doctor was becoming outdated, replaced with specialized medicine. This meant that many times, the family physician was not allowed admitting privileges to hospitals and had to turn their patients over to "specialists". In a bold and courageous move, 19 Tulsa doctors took on the challenge to build a new non-profit hospital in the 1960's. These family physicians wanted their own hospital and would use only private money to build it. At one time, all of Tulsa's physicians were located downtown in basically one building - that being the Medical Arts Building which sat on the southwest corner of 6th and Boulder. When these young doctors began searching for a place to build their hospital, they had to go way, way out to "the edge of civilization" to find their land, located at 24th and Harvard. They purchased 10 acres of suburban tract land for $180,000 from the Batsell brothers. This was the highest price recorded at the time for that amount of land. The Batsell's had inherited this land from their father, F.N. Batsell who died in an automobile accident in the 1950's. 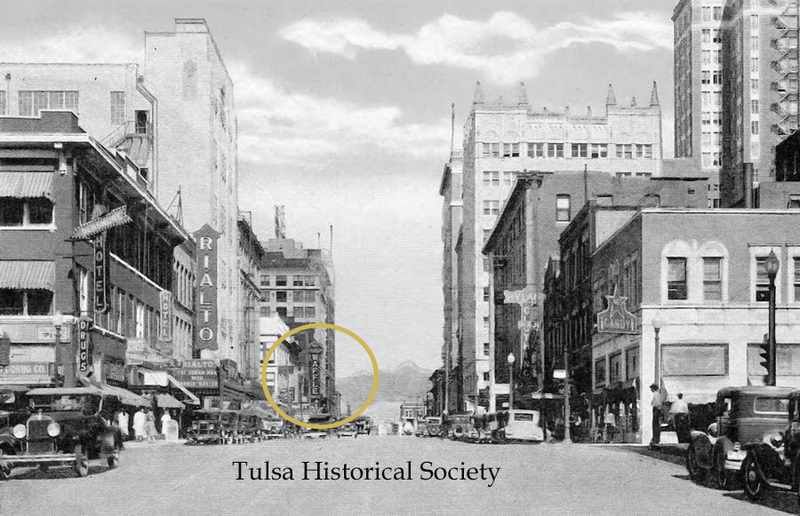 Mr. Batsell was the president of the Coca-Cola Bottling Co. of Tulsa. He had purchased this land originally to build a bottling plant but the zoning was denied. He was considering building a shopping center there at the time of his death. When the doctors purchased the land, there were just a smattering of houses in Mayo Meadow neighborhood and virtually no businesses east of there. 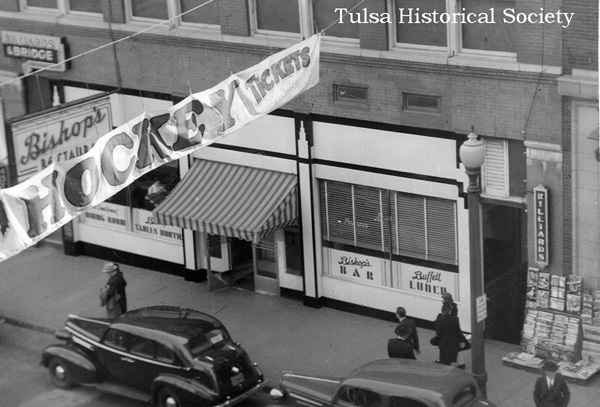 It took them some time to find a bank that would loan them the money; in fact, they had to go out of Tulsa to do it. When construction began the crews were faced with building on land that was once a coal mine. It meant digging very deep. The hospital eventually opened in August of 1966 with 100 beds and was designed with the comfort and well-being of the patients in mind. There was a 24-hour public restaurant and color televisions in every room. The hospital was a financial success. It was expanded twice, a chapel and conference center were added as well as a six-story professional building for about 30 doctors. Thanks to doctors like this founding group, Family Medicine became a recognized specialty. 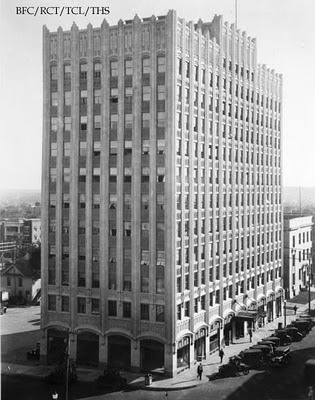 Tulsa's Doctor's Hospital was the first to carry the emblem of the American Academy of Family Physicians. And the first hospital west of the Mississippi to be built completely with private funds. Doctor's Hospital was sold on September 29, 1983. With the proceeds of the sale, the founding physicians established a non-profit group called the Founders of Doctors Hospital, Inc. which supports the charitable activities these physicians believed in. The last living founder, Dr. Joe Salamy, passed away last August at the age of 91. A couple of friends and I went out there today, actually, and had a look around. There's still lots of snow but you can tell where things are by anomalies in the snow. While we were traipsing around, one of the people who lives in one of the houses that can see the parking lot from their backyard came and talked to us for a little while. She said it was definitely old overflow parking for Doctor's Hospital (and was much more interested in the foxes that live back there). The interesting thing to me, though, is that we peeked into the drains that are still in place in the curbs and could two different levels; the water was running in the second level down, and the separation between the levels was evident by a sort of shelf of concrete that looked like it had been broken. I've looked in a lot of storm drains in the past few years due to a predilection for saving trapped ducklings and never seen two different levels like that before. Plus, it looked like the "shelf" had exposed rebar, like it had broken off. My friends and I wondered if the lower level could be an old coal mine shaft, but it would be nearly impossible to tell without going down there when it's dry, and even then would be way too dangerous. We could tell that the water was running parallel to the street leading up to the parking lot. However, the storm drain on the entrance street didn't have the second, lower level. I was contacted recently by Jim M. regarding the History Mystery post from last year- the one regarding the mysterious parking lot by the Harvard Apartments. The mystery of this lot still remains, but Jim shares some insights and memories from growing up near this area which are, as always, great to share. Enjoy (and thanks Jim). with a grass field to the south. parking for the apartments and terminated on the Tulsa State Fairgrounds. find the fastest paths through a neighborhood, without regard to roads. at 25th and Harvard would have been through Hobo Jungle. route cruiser, a Penny's "Foremost", was a challenge. vague memory of actually seeing anyone camping there. place and and ruin it all. Lucinda Mine (13) has two entrances near the area in question. with any level of certainty, but not unlikely. once when they were moving railcars to/from the fairgrounds. that it runs to Mockingbird Lake. In conclusion, the area that was once a mid-city secluded "wildspace"
has been paved over and turned into a parking lot that no one uses.